Police have named the man killed in a crash at the intersection of Botany Road and Ti Rakau Drive, Botany on Monday. He was Zhengwen Hu, also known as Alan, aged 50 of Auckland. “Our thoughts are with Mr Hu’s family and friends at this time,” a police spokesperson said. Mr Hu was killed after a car smashed into his car whilst he and two other vehicles were waiting at a red light. The crash involved four vehicles. Three cars were stationary at the intersection of Botany Road and Ti Rakau Drive waiting to turn right. The fourth car collided with the third car, in turn shunting all three vehicles forward. Police have confirmed Mr Hu died in the crash just after 5pm. Another driver involved in the incident remains in hospital. Police are appealing for any witnesses of a vehicle involved in the fatal crash. Police would like to hear from anyone who may have seen, or have dash camera footage of, an older model Holden Commodore executive vehicle being driven prior to the crash. 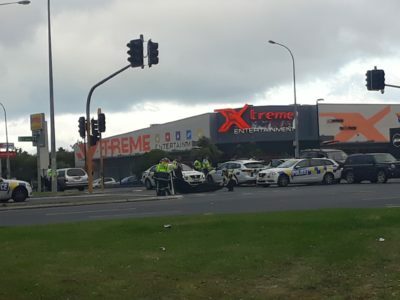 Police believe the vehicle may have been in the nearby east Auckland areas around Botany Road, Ridge Road, Bleakhouse Road, Pakuranga Highway and Aviemore Drive. The driver of that commodore needs to be locked up for a very long time.